Thousands of professionals and experts often want to sell their knowledge to the world through their websites. That's where premium online courses are the best options for everyone. Creating, hosting and selling online course is not a cakewalk unless you have some specialized tools for the same. If you're using WordPress, you can easily take advantage of select plugins that easily allows you to create and sell premium online courses. Depending on the type of premium course, the extent of customization and features can vary a great deal. I've included some of the best extensions in the list below that can help you easily host online courses. Almost all of these plugins ensure that even a non-techie can configure the entire set up for running a popular online course. So here we go to create an online course for us. 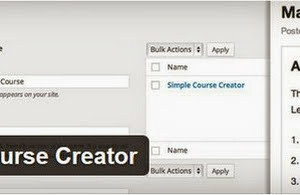 Simple Course Creator - As the name implies, this dead simple plugin facilitates easy creation of online courses in a few simple steps. This parent plugin can be extended easily by several other additional plugins to power your online courses. It's an open source plugin available on GitHub. Developers can easily modify it according to the client's needs. It provides an easy way to interlink a series of posts with each other to create different types of courses. You can display the course content in different ways so that it integrates seamlessly into your existing design. CoursePress - This is one of my favorites and powerful plugin to create flexible online courses. You can create both paid and free courses through this plugin. It supports several popular payment gateways you can use for powering the payment processing. You can integrate countless advanced features like grading, instructor management, multimedia based courses and much more. You can also integrate live chat feature for students through this plugin. With the help of shortcodes, you can easily integrate various course features at the desired place on your website. Educator WP - You can create both online courses and quizzes through this flexible plugin. You can add multiple lecturers who can independently maintain and edit their respective courses. Flexible grading system ensures you can track the performance of subscribed students. It also has a full-fledged notification system to keep you up to date with the happenings. You can easily integrate multiple payment methods in a few clicks. It also includes a handy feature for adding manual payments that's sometimes a lifesaver. You can also add different levels of a course. WpCourses - This is another amazing plugin to create and sell online course through WooCommerce platform. You can create completely automated course schedules that require almost no maintenance. Registered students can easily see their grades, notifications, and feedback from the instructors. You can also easily create custom schedules for new enrollments, whenever required. It has a powerful and user-friendly interface that every instructor and student can use quite easily. You can create an unlimited number of courses with different levels through this plugin. Sensei - This excellent solution gives you tons of flexible options to create very user friendly online learning experience. Each subscribed user gets its own dashboard to learn and track his progress. This plugin has its own powerful analytics system designed specifically to track the entire online course set up with dozens of user-friendly reports. You can easily create question banks for registered students and can randomize the database for them. You can also create and distribute custom certificates for all the students who've successfully completed the registered course. Zippy Courses - This all-in-one course selling plugin includes several useful features to create different types of learning courses for the target audience. Its drip course feature allows you to easily sell long-form learning curriculum with the support of recurring payments. Apart from premium courses, you can also sell custom digital downloads through this plugin. It has a powerful drag 'n' drop editor to instantly create new custom courses with ease. You can create multi-level courses with no limit on the number of customized courses you create with this useful solution. LFE Online Courses - This intuitive plugin has a wizard-based interface that facilitates quick creation of custom online courses for your students. You can easily create video-based courses through it. It also supports flexible reporting module to track your course library performance. You can also easily connect your courses to your Facebook business page to get more leads and conversions. You can create both one time and recurring payment courses for your target subscribers. I've used this plugin for one of my old clients and her feedback was positive about its usability. LearnPress - The name of this plugin clearly suggests what it all about. It has one of the nicest interfaces with impressive reporting module about the online courses you've created for your customers. You can use both PayPal and credit card options for your potential subscribers. Apart from creating media-rich courses, you can also award custom course certificates to the subscribers. You can also add handy audio narration of the course material to help students grasp the contents in an easy way. Fortunately, you can integrate the same learning material across multiple courses.